Overseeding is an integral part of lawn care that can help promote a beautiful lawn. 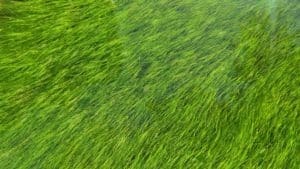 Over a three-to-four year period, turfgrass begins to thin out and the health of your lawn can decline. Overseeding can help counter this by thickening the turfgrass strands and increasing the density and overall quality of your lawn. Before you get started, learn more about the types and benefits of overseeding as well as tips and tricks to help ensure your success. There are two ways you can overseed your grass. The first method is seeding your current turfgrass species with the same type of seed. An example of this would be overseeding a tall fescue lawn in the spring or fall with tall fescue seed. Tall fescue, as well as other cool-season turfgrasses such as perennial ryegrass, cluster as they grow, which limits lateral spread and makes overseeding necessary. The second method of overseeding can be done by seeding cool-season turfgrass into an existing warm-season turfgrass, typically done to add seasonal color to the landscape. As temperatures drop into the 50s and 60s in the fall, warm-season bermudagrass begins to go dormant and turns a brown or tan color. So, in the early fall, you should overseed bermudagrass with a cool-season turfgrass such as perennial or annual ryegrass. This enhances the color of the turf throughout the dormant months and early spring. A successfully overseeded lawn will better maintain its vibrant color as the seasons change. The best time to overseed is dependent upon the turfgrass species. For example, overseeding with a cool-season turfgrass is best accomplished in the fall – specifically, mid to late September through the end of October. Schedule overseeding far enough in advance that the new seedlings are well established and can be mowed two to three times prior to the first hard freeze. The ideal soil temperature for warm-season bermudagrass is between 68 to 75 degrees. Thus, it is best to wait until late spring or early summer to overseed warm-season grasses. Seeding can even extend into the late summer but remember you’ll need to have your warm-season grass seedlings established prior to air temperatures dropping to the 60s in the fall. Do your research to identify the right seed for your lawn, making sure you select the best quality you can. Prepare the area for seeding. We recommend you mow your grass lower. Be careful not to scalp the lawn! Overseed, and then mow as the turf fills in. It’s no trick, but one often overlooked tip is to lessen the competition between turf types. To do this, apply a growth regulator prior to overseeding bermudagrass with ryegrass. This will slow down the growth of the bermudagrass and allow the ryegrass to prosper. Additionally, applying a growth regulator a few days prior to overseeding can also help decrease the number of grass clippings and the need to mow during the establishment period. You can learn more about caring for your lawn in our resources library or by contacting us.